I have a playermodel Miku and I want to spawn a npc_citizen with that skin using "ulx ent". Is it possible to do? Note: that's what the Q menu in sandbox does - spawns a Citizen with model of Miku when I press on Miku. Re: Spaw NPC with playermodel? How to find the path to a model? 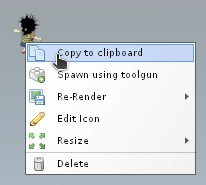 Start a new sandbox game, open the spawn menu, right-click the model and select "Copy to clipboard". What do the flag and value pairs mean? model:models/yourmodel.mdl Path to the custom model. See Topic: Pro tips for more "ulx ent" examples. Thank you! The part I was missing was citizentype:4. I tried to do it like type:unique and type:4.